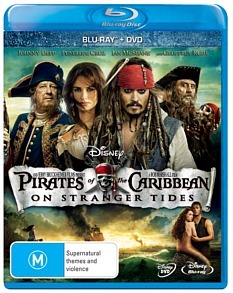 Pirates of the Caribbean on Stranger Tides Blu-ray Review While it still has moments of witty humour and exciting action, this ’Pirates’ doesn’t match the standards set by what has come before it. So where to now for this iconic Disney franchise? Over the past three instalments we’ve been treated to outrageous CGI action, inventive set-piece stunts and loads of charm and humour. But after the conclusion of ‘At World’s End,’ do we really need another go-around? Or has Mr Bruckheimer’s cash cow been asked to produce too much? The fantasy elements and humour that made the previous movies so successful are still here. What’s lacking is any chemistry between the actors; the absence of Keira Knightly and Orlando Bloom hurts. Without them Depp is adrift, having lost two parts of the trio that gave the movies their fun dynamic. Ian McShane and Geoffrey Rush do their best, but their talents are criminally wasted here. Rather than act as the showcase scenes, I found the sword fights in ‘On Stranger Tides’ held up an already slow story. A few of the big set-piece stunts are entertaining, but they’re too few and far between. You feel like the storytelling has really gone awry here. The brief seems to have been ‘epic,’ which has translated into ‘long.’ I’m not sure why the characters needed to stand around debating who was going to jump off the cliff in search of the silver goblets for quite so long. The purpose of this scene seems to be to set Blackbeard up as a treacherous scoundrel, which we already know anyway. The musical score groans, rather than inspires. There are trickles of the irreverent and swashbuckling tracks from previous outings, but they’re kept to a minimum and never really set loose. The soundtrack this time around is mostly overpowering, and feels detached from what’s happening on screen. As well as the blooper reel, there is a two-part Featurette called ‘Lego Pirates of the Caribbean - Captain Jack’s brick tales.’ This isn’t nearly as funny as it sounds, just a CGI promo. There is also some commentary by Director Rob Marshall and Executive Producer John DeLuca. While it still has moments of witty humour and exciting action, this ’Pirates’ doesn’t match the standards set by what has come before it. Maybe it’s time for Mr Bruckheimer to stop yanking those teats, because this old girl can only give up a trickle of what she once could. This release is basically the same as the DVD version, however the video quality is far superior. Unfortunately we could not test the 3D version of this film.